Gwyddion is a modular multiplatform software for SPM data analysis. The main idea behind Gwyddion development is to provide modular program for height field and image data processing and analysis that can be easily extended by modules and plug-ins. Moreover, the status of free software enables to provide source codes to developers and users, which makes the further program improvement easier. Thanks to the Free Software/Open Source nature of Gwyddion, all formulas, methods and algorithms are public and open. Anyone wishing to study or compare the fine calculation details that are beyond the scope of the user guide can read the actual implementation. All calculations are performed in double precision, and Gwyddion native data format (.gwy) stores data in double precision too. Under normal circumstances, no information is ever lost due to the limited precision or range of values. The Gwyddion data format can contain an arbitrary number of images, graphs, spectra or volume data. Gwyddion uses a fairly general physical unit system, there are no built-in limitations on the types of physical quantities data (and lateral dimensions) can represent. Units of slopes, areas, volumes, and other derived quantities are correctly calculated. SI unit system is used whenever possible. Tools and other dialogues remember their parameters, not only between tool invocations within one session, but also across sessions. Gwyddion native file format (.gwy) supports saving all data specific settings: false colour palette, masks, presentations, selections, associated 3D view parameters, graphs associated with that data and their settings, etc. 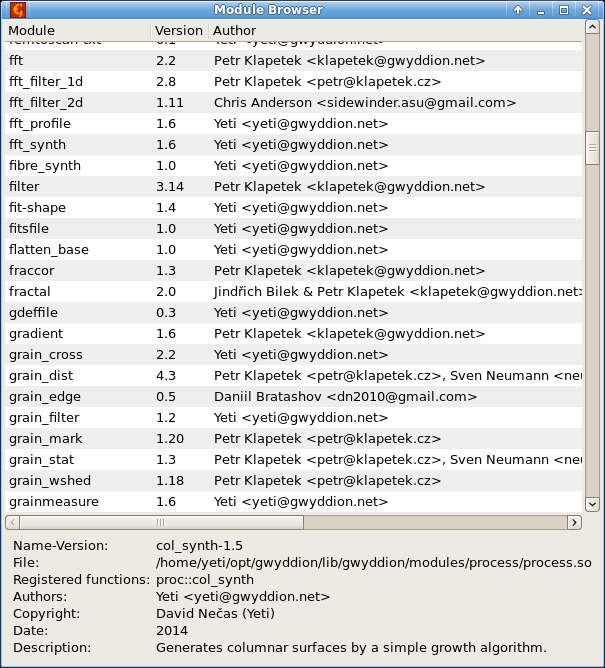 Most Gwyddion library functions are available in the Python interface pygwy. Gwyddion can be extended by file and processing modules written in Python. Gwyddion is well integrated to free desktop environments such as GNOME, XFce or KDE, including e.g. menus, file type associations and automated SPM file thumbnailing. Certain integration to other desktop environments also exists, although not to such level. 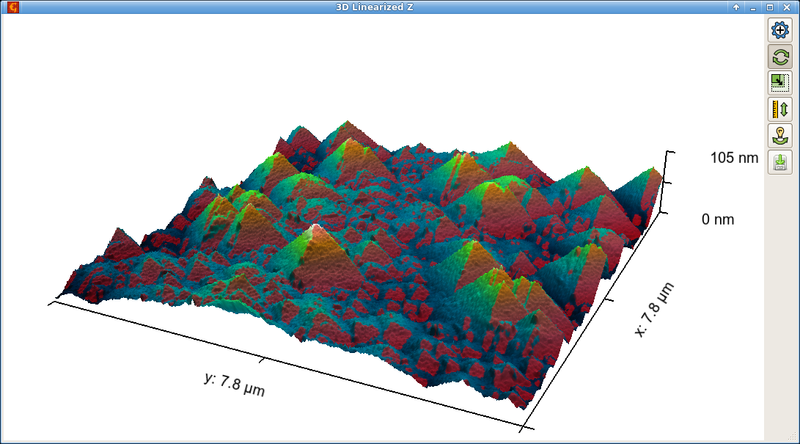 Gwyddion supports about 100 microscopy and image formats, namely for reading. Several formats can be also written. An up to date complete list of supported file formats is present in the user guide. 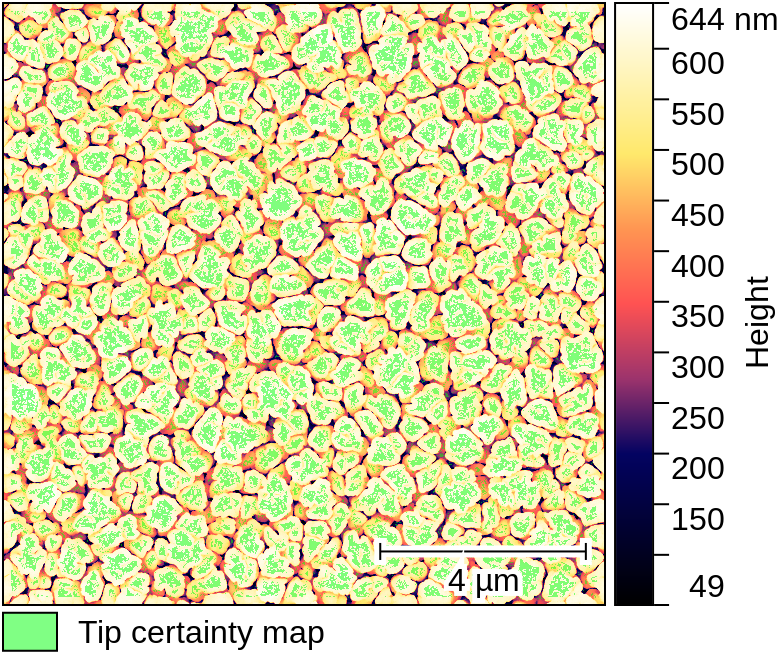 We would like to support as many AFM, STM, …, profilometer and general height-field formats as possible, of course. If you want your own format to be supported, please read the file format situation description. The data processing abilities depend on loaded modules abilities. There are already quite a few modules present in the package. However it is possible to add more data processing capabilities to your Gwyddion installation simply by installing new data processing modules, even from third parties. In a similar way, you can write your own modules, test them on your Gwyddion installation and then send them to other Gwyddion users. The same statements are valid also for plug-ins that represent other way how to improve Gwyddion. Writing plug-ins can be little bit easier (you can use any programming language, for example). However, you can not use existing Gwyddion data processing functions and widgets when writing plug-ins. There is documentation on module and plug-in writing available as a part of libgwymodule documentation, sample plug-ins in C/C++, Perl, Python, Ruby, and Pascal are distributed directly with Gwyddion source code, and there is also a sample standalone module available. An on-line version of module browser is available, in two forms: dynamic, with description pop-ups (needs a modern WWW browser) and a plain expanded table. If you have any problems or questions concerning module or plug-in development, do not hesitate to ask us.